The State Commission on Judicial Performance by a vote of 10 to 0 recommends that Justice Brian D. Boatright BE RETAINED. Justice Boatright was sworn in as a Justice of the Colorado Supreme Court in November 2011. He graduated from Westminster College in Fulton, Missouri in 1984 and received his law degree from the University of Denver in 1988. He spent 9 years as a Deputy District Attorney practicing in Jefferson and Gilpin Counties. He then served for 12 years as a District Court Judge in the First Judicial District presiding over criminal, probate, civil, and juvenile matters. 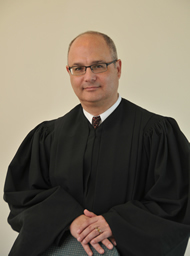 Justice Boatright has served on numerous boards and committees, including the Juvenile Services Planning Committee, Children Youth Leadership Commission, Plain English Jury Instruction Committee, Judicial Training Committee, and Court Improvement Committee. As a member of the Colorado Supreme Court he has taken a special interest in community outreach, regularly presenting to civic organizations and educational institutions. The Commission conducted a personal interview with Justice Boatright, read opinions that he authored, observed him in court, reviewed his self-evaluation, and reviewed survey responses from attorneys and judges regarding his performance. Among the survey questions was "how strongly do you recommend that Justice Boatright be retained or not retained in office?" Of attorneys responding to this question, 66% recommended to retain, 15% not to retain, and 19% made no recommendation regarding retention. Of judges responding to this question, 97% recommended to retain, 1% not to retain, and 2% made no recommendation regarding retention. The survey responses of district and other appellate judges indicate that Justice Boatright is fair and conscientious, and that he brings a common sense approach to the Court. The attorney responses to the survey indicate Justice Boatright's performance is strong in courtesy toward attorneys and allowing them the opportunity to present arguments. In most other categories Justice Boatright’s scores were comparable to those given other Justices in past evaluations. The attorney survey responses reflected concerns in the areas of writing opinions that adequately explain the basis of the Court's decision and making reasoned decisions based upon the law and facts. The Commission reviewed a number of opinions written by Justice Boatright and found they often lacked the quality of composition expected of a Supreme Court Justice, and at times did not adequately set forth the analysis supporting them. In his interview, Justice Boatright indicated that he has taken steps to improve his writing skills. The Commission believes that Justice Boatright's continued attention to this area will help him better communicate the legal analysis supporting his opinions. Justice Boatright brings to the Court a strong work ethic as well as a practical perspective to decision-making. Justice Boatright makes a positive and valued contribution toward improving the collegiality and collaborative spirit of the Court.